Hillsboro City Schools curriculum specialists Alicia Sellins, left, and Shelley Beumer give a presentation Wednesday to the board of education. Seated are Hillsboro Superintendent Tim Davis, right, and local resident David Grover. Hillsboro Superintendent Tim Davis, left, presents a plaque to Doug Ernst in appreciation of his 14 months of service on the Hillsboro Board of Education. Ernst will be replaced by Jerry Walker in 2018. Hillsboro scores are improving on state-mandated testing, curriculum specialists Alicia Sellins and Shelley Beumer told the Hillsboro City Schools Board of Education during its regular meeting Wednesday night. On the 2017 State Report Card, the Hillsboro City Schools graded an A on K-3 literacy, B on progress, C on graduation rates, D on achievement, D on prepared for success and F on gap closing. But the specialists said the scores are more complex than just a letter grade and that Hillsboro students are scoring at or above the statewide proficient percentages in most testing areas. “We have started to outscore the rest of the state now, but we have more room we need to grow,” Sellins said. In another matter, the board approved a contract between the city of Hillsboro and the school district for a school resource officer from from Jan. 1, 2018 through Dec. 31, 2018. Superintendent Tim Davis said the officer is technically an employee of the police department, but will work for the school district 176 days when students are in class. Davis said the officer spends most of his time at the high school, and a lot of that monitoring the parking lots, but also makes visits to the elementary school during student dropoff times and at least a couple of visits weekly to FRS, where a select number of students attend classes at the former kindergarten center. “I think it’s great publicity for us to be able to work with the city and knowing somebody is in our complex every day students are in class,” Davis said. • The board set its 2018 organizational meeting for 7 p.m. Monday, Jan. 8 at the board offices. Current board president Bill Myers was appointed to serve as president pro tem during the meeting, when the board will elect a president for 2018 and set its meeting dates and times for the year. • The board approved the following students for early graduation pending the completion of their final graduation requirements: Kaylen Brunner, Marissa Carter, Elleanor Doyal, Hunter Hacker, Colton Nelson, Summer Simmermon, Hailey Snyder and Aleigha Tarbutton. “This way they can get out of the building and get on with life and don’t have to sit through study halls and classes they don’t need,” Davis said. He said the students will still be able to participate in the regular graduation ceremonies. • The board approved a revision to its 2018-19 course handbook, eliminating a crafts class and adding a sculpture class. • The board approved indoor coed track as a school-sponsored sport. • The board approved the following donations: anonymous, $20 to robotics, anonymous, $105 to robotics; Dakota’s, Jim Shorten, $304 to Hillsboro City Schools; Esoteric Club, $200 to elementary school library; Hillsboro Uptown Business Association, $200 for Christmas Adopt-A-Family program; Dr. Kulkarni, $500 for toys and clothes for students; NCB, $200 for coats for elementary students. 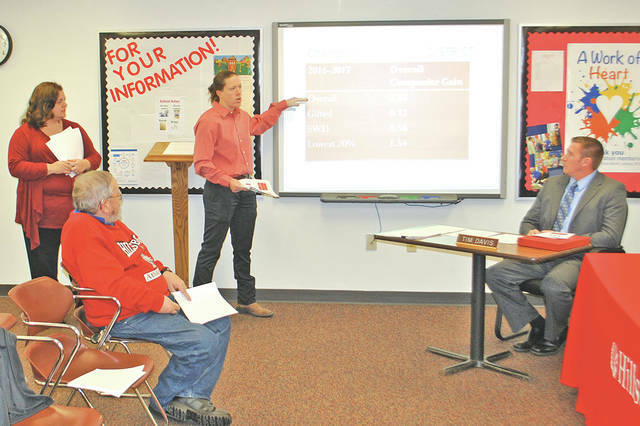 • During his superintendent’s report, Davis said the school district has completed several projects recently and is considering future projects including an auditorium at the middle school/high school, a baseball and softball complex, and improved parking at the elementary school. • Isabelle Bourne, the student representative to the board, said the school has collected about 1,100 gifts and around $1,000 in donations for the Hillsboro to Houston Holiday Gift Drive, a program that intends to deliver a caravan of Christmas gifts to students at Evan E. Worthing High School in Houston just after Christmas. The Houston, Texas school was ravaged by Hurricane Harvey and the program’s goal is to assure that every student in Worthing High receives at least one Christmas gift this year. • Board member Larry Lyons said the Hillsboro Athletic Boosters are trying to recruit new members. He said 14 people attended the booster’s most recent meeting and that two agreed to take over the annual Hillsboro Red Carpet Gala put on by the boosters. Lyons said the boosters have raised about $50,000 for the school district each of the last two years. https://www.timesgazette.com/wp-content/uploads/sites/33/2017/12/web1_School-bd-pic-1.jpgHillsboro City Schools curriculum specialists Alicia Sellins, left, and Shelley Beumer give a presentation Wednesday to the board of education. Seated are Hillsboro Superintendent Tim Davis, right, and local resident David Grover. 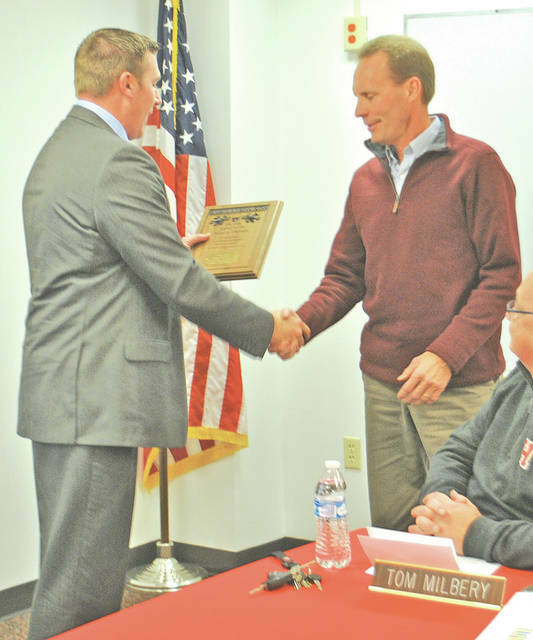 https://www.timesgazette.com/wp-content/uploads/sites/33/2017/12/web1_School-bd-pic-2.jpgHillsboro Superintendent Tim Davis, left, presents a plaque to Doug Ernst in appreciation of his 14 months of service on the Hillsboro Board of Education. Ernst will be replaced by Jerry Walker in 2018.